At some point, while shopping for a vehicle lift online, you are bound to run across at least one company – possibly more – advertising their “innovative roller carriage design” as the new industry benchmark. These assertions are usually coupled with ideas that roller lift carriages are better than the alternative slider block lift carriages in a two post lift. Do not be fooled. Rollers – state of the art technology in the 1970’s – have a line of contact that creates high stress on both the roller surface and the interior surface of the lift column. Within a few years of commercial service, this high stress contact will wear grooves into the column casing. Such grooves lessen the ability of the roller to contact properly and create a very unsafe lifting condition. Because of this tendency, most manufacturers switched from roller carriages to slide blocks in the 1980’s. Slider blocks, on the other hand, provide a much larger contact area with the surface of the lift column allowing for greater stability as the carriage travels up and down. 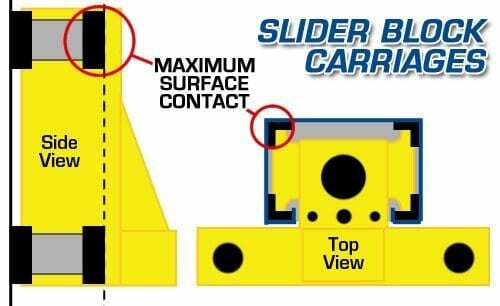 Because of this increased surface contact, slider block carriages do require better quality cylinders and a more efficient power units than two post lifts featuring roller carriages. While these higher quality cylinders and power units are a bit more expensive than those on roller carriage lifts, it is important to understand that the slider block lifts, with higher quality components, are safer and will be safer longer than their cheaper roller carriage counterparts.